Vera Mont create gorgeous dresses that are elegant, feminine and timeless. 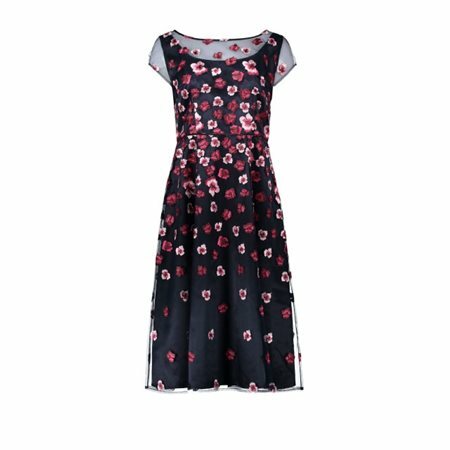 This beautiful dress had been adorned with embroidered raspberry, rose and plum coloured flowers on a navy lace. The dress gathers in at the waist with subtle navy stitching that gives the skirt a fuller look. It has delicate capped sleeves and a deep scooped neckline. We love the detailing on this dress, it has been beautifully tailored and would be a wonderful choice for a party or special occasion this season.